Read an explanation of the symbols in the World Meeting of Families logo. 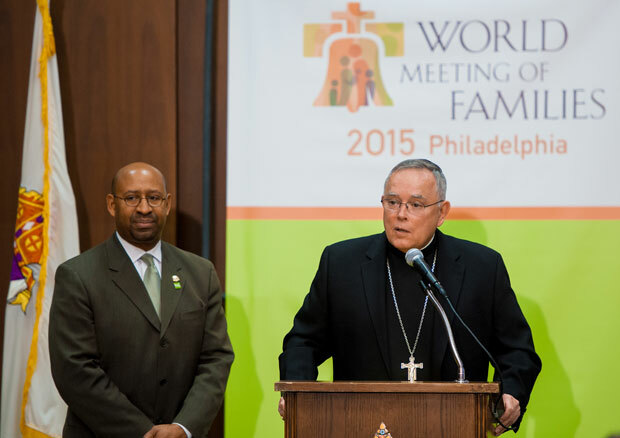 Global attention will turn to Philadelphia in three years when the city expects to welcome hundreds of thousands of families for the World Meeting of Families — and possibly the new pope. Archbishop Charles Chaput led a morning press conference Feb. 25 to announce that the Vatican confirmed earlier in the day the long-anticipated selection of Sept. 22-27, 2015 as the date for the gathering of families, Catholic and non-Catholic, from around the world. The pope will resign from his ministry Thursday evening, and a conclave to choose a new pope will be called soon thereafter. The last World Meeting of Families was held in Milan, Italy, in 2012 and drew 350,000 people for events supported by 5,300 volunteers. On the closing day, more than 1 million participated at Mass with Pope Benedict. The World Meeting of Families began in 1994 at the behest of Pope John Paul II. It is held every three years has since grown to attract thousands of families for days of events – capped by the final day’s celebration of Mass by the Pope. The Philadelphia event will be the first to be held in the United States. Workshops and conferences are expected to discuss many facets of contemporary family life in order to strengthen and support it. While the archbishop did not know how many would attend the five-day event, he said he and planners would gauge attendance at previous meetings and make an estimate for Philadelphia. The event is expected to draw families from across the eastern United States and other regions, plus Canada and Mexico and throughout the world. One thing he was sure of was that the cost for hosting the meeting will be high. He estimated the World Meeting of Families event in Milan cost 10 million euros, which is more than $13 million in U.S. currency. “I’ll be responsible for raising that money,” Archbishop Chaput said. He mentioned the Philadelphia Archdiocese’s financial difficulties, which led to administrative downsizing and layoffs last year, and that he expected to raise the necessary funds for the meeting “from outside sources” and with the help of a fundraising group that he did not name. The archbishop also said he didn’t know why Pope Benedict chose Philadelphia for the event – “His Holiness didn’t tell me,” he said – but noted some good reasons. The city is seen as the starting point for the United States and the foundation of its political ideals, including human freedom and especially religious freedom, which Pope Benedict mentioned during his 2008 visit to the U.S. Calling Philadelphia “an American Catholic icon” boasting two saints – St. John Neumann and St. Katharine Drexel – he also noted the Archdiocese’s more recent struggles concerning the clergy sexual abuse crisis. “The Church in Philadelphia is also a community in need of healing and renewal,” Archbishop Chaput said. “We have a very serious duty to help persons who have been hurt in the past to heal, and to better protect children and young people moving forward. Joining the archbishop at the press conference was Philadelphia Mayor Michael Nutter. 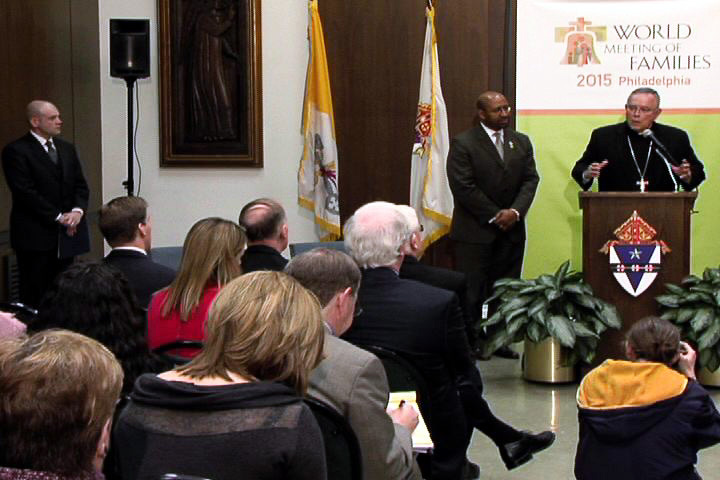 He and Pennsylvania Governor Tom Corbett have been named honorary co-chairs for the event by Archbishop Chaput. Neither Nutter nor the archbishop would confirm locations of events but the mayor was confident that city services would be able to handle the expected visitors. He was also excited about the opportunity to show off the city on a worldwide stage. Himself a product of Catholic education at St. Joseph’s Preparatory School and the former Transfiguration of Our Lord School in Philadelphia, Nutter said the significance of a foucs on family life extends beyond the Catholic community. Gov. Corbett, who was in Washington, D.C., for the Governors meeting and could not attend the press conference, praised the diversity of faiths in Philadelphia and Pennsylvania, both historically and today. “As the first ever American host for the World Meeting of Families, I am confident that Pennsylvanians — of all faiths — will warmly welcome all those who will join us for this historic event. Archbishop Chaput speculated that a new pope, who will be elected by the College of Cardinals in Rome likely in coming weeks, would visit Philadelphia as the capstone to the World Meeting of Families event by celebrating Mass on the concluding day, Friday, Sept. 27. “I can’t imagine he won’t come, but I won’t promise,” he said. He expected more details to emerge especially after he, Corbett, Nutter and others travel to Rome to meet with the World Meeting of Families event organizers, including its sponsor, the Pontifical Council for the Family. Archbishop Chaput said the meeting would also include the newly elected pope – whoever he may turn out to be.